DON’T FALL FOR an argument that relies solely on the origin of something and ignores the current reality. How something started is not always relevant to what it is today. Easter may have started as a pagan spring festival, but does that undermine its legitimacy today? Easter is now celebrated by Christians as the resurrection of Jesus Christ and is typically the most well-attended service of the year. Australia was originally populated by aboriginal people—hunters and gatherers—and then settled by the British through the transportation of large numbers of male and female prisoners. So is Australia uncivilized? Hardly. Today Australia has one of the world’s largest economies, and life expectancy in Australia is also among the highest in the world. The previous excerpt is quoted from The Joy of Argument, by Albert Navarra. As we approach the holiday season, it’s always a popular time to debate the origins of what we’re celebrating. Is Thanksgiving a celebration of the oppression of millions of Native Americans, or a celebration of thankfulness and the American story? Is Christmas a celebration of the birth of Jesus, a secular celebration of modern goodwill among men (ho ho ho! ), or a bastardization of the pagan festival of Saturnalia? These are all good questions, worthy of civil discourse. The origins of a holiday aren’t necessarily what we celebrate today. However, the origins can provide a jumping-off point for needed discussion and sometimes protest. When protest of an origin is worthwhile, remain civil. The person joyfully celebrating the holiday at your dinner table likely isn’t celebrating the atrocities you’ve associated with the occasion. Is there room to joyfully celebrate with the people we love, while still opening the door for thoughtful discussion? Argument is beautiful and necessary to move our society forward. 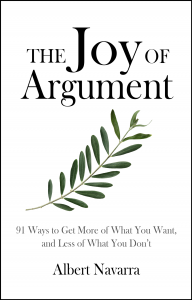 Learn how to do it well, to change hearts and minds, by purchasing The Joy of Argument on Amazon here.